The Employer Council of Champions (ECC) hosted its sixth annual Summit on March 5 and 6, 2013, under the theme “Diversity Works! Energize, Engage and Excel with Ottawa’s Global Talent”. During the two-day event, over 200 participants, including business and civic leaders, human resource managers, skilled immigrants and community stakeholders came together to exchange ideas, celebrate employer excellence in Ottawa, and hear from leading experts and practitioners about best practices in managing and leveraging diversity in the labour force. 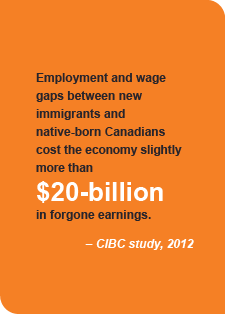 Optimize their talent prospects by broadening their hiring pool to include immigrant talent. In her remarks, Gaye Moffett, Founder, GEM Healthcare Services and Co-Chair, Employer Council of Champions, highlighted the accomplishments of HIO since its inception in 2006 and how the collaborative efforts of local employers, community partners and stakeholders is fostering systemic change within workplaces. The 2013 Summit theme, she averred, reflects a new way that leading employers are thinking about workplace diversity. “Many employers are embracing diverse talent as an essential element of their organizational and business strategies, developing inclusive workplace policies that value diverse perspectives, and optimizing their talent prospects by gaining access to the local talent pool of internationally educated immigrants” said Ms. Moffet. Ms. Moffet also stressed that there was still more work to be done to ensure that all employers can successfully access and leverage the talents of Ottawa’s global talent pool. 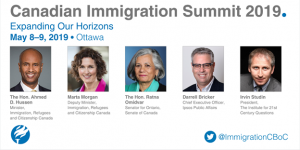 “Our ability to continue to attract top immigrant talent to Ottawa will depend in great measure on how effective we are at using the great opportunities they present. It is our job, and I would suggest, our responsibility, to take advantage of those opportunities and those skills”, said Gaye Moffett. Deputy Mayor Eli El-Chantiry brought greetings on behalf of the city of Ottawa and, reflecting on his personal experiences as an immigrant, expressed his appreciation for the work of the ECC and HIO in promoting diverse and inclusive workplace practices. In her Keynote address, Mary Karamanos, Senior Vice President, Human Resources at the Business Development Bank of Canada, underscored the business opportunities that result from today’s diverse population and how the effective engagement of global talent can strengthen entrepreneurialism and innovation among Canadian businesses. 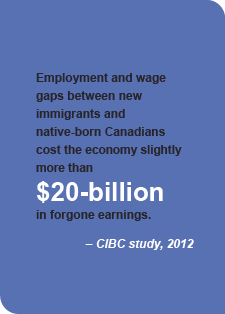 In addition to the much needed skills that immigrants bring to Canada, Ms. Karamanos described immigrants as providing employers with “a window on communities and networks both here and abroad”. A Panel discussion on Leveraging Diversity in the Workplace featured Dr. Lorraine Dyke from the Sprott School of Businesses at Carleton University and Paul Chiasson, Regional Vice-President at RBC. Dr. Dyke provided an overview of diversity management, highlighting three models in use by today’s employers, noting that the most effective approach – the Learning and Effectiveness Paradigm recognizes the importance of employee’s cultural differences, and uses them to rethink how the organization does it work and to frame issues in new creative ways. Paul Chiasson spoke about RBC’s continuing “Diversity Journey”, and highlighted the local initiatives RBC is undertaking to promote a diverse and inclusive workplace, including MOSAIC, an employee resource group for visible minorities and newcomers to Canada. Earlier at the Summit Learning Exchange on March 5, Christine Stigter, Senior Manager, Human Resources at TD, spoke about the bank’s case for diversity and inclusion, which is driven and supported by TD’s senior leadership team. TD seeks to create a workplace where people’s differences are respected and supported, barriers are removed to create a level playing field for all and where “customers feel comfortable and see themselves reflected in us”. Ms Stigter explained how TD is strategically leveraging community events and partnerships to cast a wider recruiting net and to support business development. In a fast paced “speed demo” session, four local employers – Algonquin College, RBC, Citizenship and Immigration Canada and Pythian, in four minutes or less, provided concise description of specific projects or initiatives their organization were undertaking to attract, retain and leverage Ottawa’s diverse global talent. These include, implementing robust orientation program for all new employees; undertaking cross-cultural competency training for managers and staff; accepting international qualifications; valuing foreign work experience; providing feedback to unsuccessful immigrant job candidates; participating in coaching and immigrant mentoring programs. Zaina Sovani, Director General with Shared Services Canada and a prominent community leader in Ottawa, shared her experiences as a champion of diversity and inclusion, both in her role as senior manager in the federal government and in her role as community leader and advocate. Ms Sovani spoke about the need for programs that integrate immigrants within the workplace and shared the steps Shared Services Canada has taken to develop its own diversity roadmap. The Learning Exchange was capped off with the compelling personal story of Farouq Samin a highly skilled newcomer from Afghanistan. Mr. Samin spoke of the challenges he has faced in Canada’s labour market and his experiences as a Communication Intern with Champlain Local Health Integration Network. The Learning Exchange was followed by a lively networking event, where employers had an opportunity to meet with internationally trained individuals who had been invited through the Ottawa Job Match Network and the Federal Internship for Newcomers program. HIO offers free Cross-Cultural Competency training for employers. The Ottawa Community Immigrants Services Organization run a Career Mentoring Program. Hire through the Ottawa Job Match Network and the Federal Internship for Newcomers program.